Larry & P.L. don't have human children, but they do have many, many (some say TOO many) furred children. Larry even keeps genealogical records on the cats! Whenever anything goes wrong around the house we always exclaim, "Token did it!" Token was a very special cat, one of two that Larry had for 3 years before he got P.L. He hissed at P.L. for a whole year before he gave in and accepted that she wasn't going away. 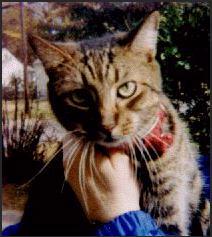 Token had a very outspoken personality and quite a few Siamese genes: for all that he was a brown tabby he was QUITE the talker! He was 16 years old when he died quietly and quickly of natural causes. We'll miss him, but he continues to live on in our hearts and minds. There'll never be another Token. Our friend Bill Anders named him Gruesome, because he "grew some". It's hard to photograph black kittens well. to Larry or P.L with any comments regarding these webpages.